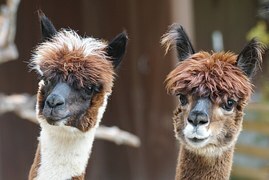 What is the difference between the lama and the alpaca? I visited London zoo this summer on our annual jaunt to see family and friends in the UK and I was delighted to see both alpacas and llamas there. The rest of our party wanted to move on but I was quite happy to gaze at these marvelous creatures. They both originate in South America and have been bred for over 4,000 years. The key difference in my mind focused on yarn, reading the article 6 Differences Between Llamas and Alpacas in the Modern Famer, is that the alpaca produces a much finer fiber than the llama. The alpaca also produces more fleece than its larger cousin and in a much greater variety of colors. What is alpaca yarn actually like? According to the marvelous Victory Ranch in New Mexico, where we stopped on a road trip (and made a yarn purchase of course) alpaca fiber is one of the softest in the world. I can attest to the softness of my purchases. It has little to no guard hair or lanolin which increases the usable fiber per pound and simplifies scouring, carding, and combing. The fiber is strong, resilient, easy to care for and long-lived. Garments made from alpaca fiber are light weight but warm because the alpaca's coat, evolved for a high altitude / cold climate, contains microscopic air pockets. Is alpaca yarn on trend? A Fortune article published earlier this year It’s a wrap: Alpaca wool hits the runway reports of a growing demand of Peruvian alpaca wool accessories for high-end boutiques in the US. Designers are seeking more exotic and rare yarns to create their pieces. The increased popularity in fair trade products also makes alpaca attractive. This is all fantastic news for the alpaca industry. For further reading, if you find alpacas as intriguing as me, check out these sites. Alpaca Frequently Asked Questions by Hill Country Alpacas This farm is just up the road from me in Texas Hill County so I'm putting it on my list to visit. Ireland's thriving alpaca industry on Olann and This is a brand new just launched online fiber and craft magazine and already a firm favorite. A definitive guide to raising alpacas in the Modern Farmer I think I'm going to stick to reading this vicariously for now! Thanks for all the factual info and links to further resources. Very useful. I'm glad you found them useful Jodie. Maybe one day I will own an alpaca or two!!? !